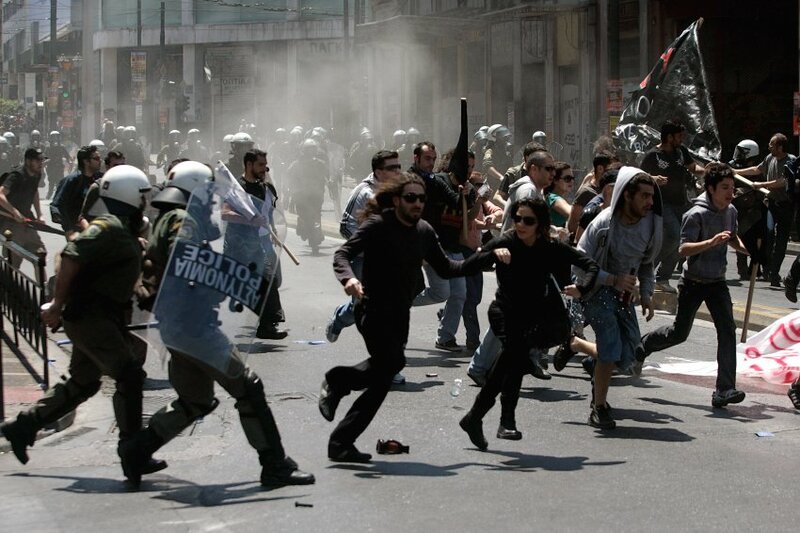 Greek riots - photo by "Piazza del Popolo"
There are still voices in the upper echelons of the EU that are insisting that Greece will neither default nor leave the Eurozone. However, analysts and investors worldwide have already broken the taboo and are announcing that, in their view, a default will take place, it is just a question of whether it will be orderly or disorderly. What is the difference? The difference is that saving the Greek economy is all fine and good but the real issue at stake is the European banking system which could be shot down in flames by a disorderly default. In the end, an orderly default will be one that leaves French and German banks intact. So how is this all going to happen? : by “ring fencing” – which would mean building a financial wall/fence (€1.5 trillion) around a crumbling Greece so that the contagion of default does not spread to other teetering economies, such as those of: Ireland, Spain, Portugal, Italy and even France. A disorderly default would be when bond investors lose all their money and French and German banks go into bankruptcy as a result – triggering a domino effect that would be felt from Los Angeles to Tokyo. Greece quite simply can no longer afford to pay its debts, especially now given its shrinking economy and diminished tax receipts. So it looks like there will be an orderly default (despite official denials) which in real terms means the restructuring of Greek debt signifying a 50% haircut (if you loaned the Greeks $100 you will get $ 50 back). Then it will all be about saving the European banking system which holds a huge amount of Greek debt – according to the Wall Street Journal “German and French banks carry a combined $119 billion in exposure to Greek borrowers alone and more than $900 billion to Greece and other countries on the euro-zone’s vulnerable periphery: Portugal, Ireland and Spain”. The follow-on problem would be that if a 50% haircut is restructured – then the French and German banks who take this loss will then have to be re-capitalised. Yes, more money. Once again governments will have to act as human shields for banks by lavishing more taxpayer money on them just so the fabric of society as we know it is not torn to shreds. This scenario is becoming something of a reign of terror. Eventually taxpayers may choose to opt for a different society and let this one go to hell. A decision will have to be made about whether to have Greece leave the Eurozone for say 10 or 20 years or to keep Greece in the Eurozone and pull the country up by its bootstraps for the greater good of the Union. Holders of Greek bonds will want them to stay in the Eurozone as they would be more likely to see at least 50% of their money rather than an unspecified amount in drachmas that could amount to zero. Remaining in the Eurozone (but still in the EU) may not actually be in Greece’s favour as this will not give them the opportunity to devalue their “Drachma Mach 2” and remain competitive. Staying in the Eurozone would require too much fiscal rigidity and the country could not kick-start itself back into growth. It is unclear what the social costs would be in either case, no doubt awful and likely violent under both scenarios. Nobody is quite sure how much money Greece is in hock for, the rough estimate is $500 billion in total. For that reason an orderly default appears inevitable. And before news of the orderly default gets out, Greeks will have currency controls imposed on them to stop them spiriting away their euro savings to Cyprus. But you have to ask yourself do any wealthy Greeks still have any money in Greek banks at this stage? Imposing this orderly default stealthily will be difficult. Much of what happens will depend on the Bundestag and whether or not Angela Merkel can convince German lawmakers that they must swallow a very expensive pill and agree to save their profligate and irresponsible neighbours. Angela Merkel is not having an easy time of it, she is under pressure from opposition and even the constitutional court who are worried that she will try and get this bail-out passed by the back door and by pulling the wool over the eyes of the German people. Where is all this salvation money coming from? From the EFSF, European Financial Stability Facility, which was originally meant to amount to €440 billion but which now may be increased. This was the facility created by the EU for just such an eventuality but it is now clearly inadequate. There has been talk in the press of increasing the size of this facility by leveraging its value (issuing bonds- sound familiar?) to over €1.5 trillion but as each day goes by this idea appears increasingly speculative – certainly in the view of some exponents of the German government. Germany, as the biggest EU economy will be the facility’s biggest contributor, hence the country’s ill humour. Many Germans and non-Germans too are crying out that this is just throwing good money after bad and is not the solution, this financial aid has to be linked to eradicating the problems that caused this crisis in the first place and that is the low tax receipts paid by ordinary Greeks for whom tax dodging is a question of national pride and also the eradication of a useless and corrupt army of federal employees who are merely a millstone around the neck of the economy and are the recipients of jobs for votes arrangements – clientelism gone mad (see Italy). As of today the Greek parliament has just passed a property tax (cleverly levied via electricity bills) which will reduce this year’s budget by $2 billion but this may not be enough to solve the problem. It may get them the further $8 billion in bailout money but it is a drop in the ocean of their debt. At the moment it is all about showing willing. Analysts are so negative because the hard figures make grim reading: the country has €353 billion in government debt alone, which is about 150% of its GDP. As if this were not enough the IMF is predicting that the Greek economy will shrink by 5% in 2011 – imagine how this will affect tax receipts. So the Germans are left holding the baby. Some Germans are even thinking that their only salvation is to leave the Eurozone themselves and their profligate neighbours be damned. This is an unlikely scenario but convincing the German parliament and electorate to stump up more cash for their useless cousins will not be easy. So now it is all about preparing the groundwork without spooking the markets, or the German electorate. The orderly default will have to happen swiftly and efficiently, it will be frightening but must not be devastating. So who is running the show? Given the huge political deficit in Europe (vain, puffed-up, lascivious and mediocre politicians), the task has fallen, by default, to the European Central Bank. The grim central bankers in Frankfurt will be managing this chaos, something that is well beyond their institution’s remit. And at the helm will be (no not a German) but a respected Italian banker, Mario Draghi. Not a scenario you would have envisaged ten years ago.